This system consists of a sensor probe mounted in a pneumatic pipeline, gravity chute or feeder and a control console mounted in an area accessible to users. The FDS 1000 Remote Sensor probe is a high quality, industrial grade instrument that senses flow/ no-flow conditions using non intrusive Doppler technology to provide highly reliable and sensitive motion detection. It works by transmitting a low energy signal through a Teflon process seal into the material flow system. A portion of the signal is reflected back to the sensor, with the movement of material causing a frequency shift- called the Doppler Shift which is used by the sensor to detect material flow. Both remote and integral versions are available and the typical application consists of Flow Detection in Pneumatic Conveying Pipelines, Over Conveyor belts and Solid Flow Pipelines. 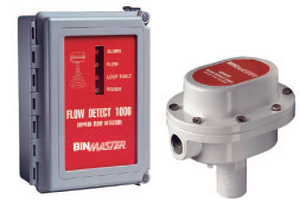 The Microwave Flow Meter is a solid flow sensor with the microwave technology. 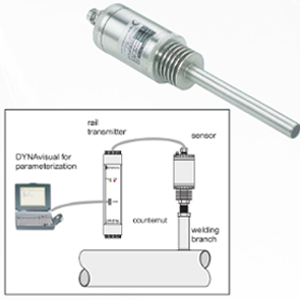 It can monitor the relative balance of flow rates in multiple branch pipes divided from a main pipe.The system is suitable for on-line measurements of powders, dust, pellets, and granular from 1 nm up to2 cm in pneumatic or free fall condition.The measurement principle of the DYNA M-Flow is based upon the physical Doppler-Effect / Microwave Based, whereas the sensor generates a uniform field in the microwave frequency range inside the pipe. These microwaves are being reflected by particles passing through the pipe. 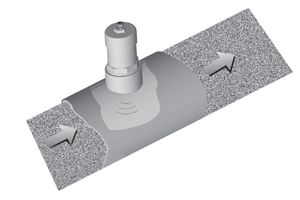 Calculation of frequency and amplitude changes allows for accurate determination of solid flow. Non moving particles like dust accumulation are excluded from calculations.